You can travel to Münster via several airports. The international airport Münster/Osnabrück (FMO) offers numerous European and domestic connections and is located approximately 30 km from Münster. From this airport, you can get to Münster’s central station by bus (lines S50, D50 as well as R51) or by taxi in about 30 minutes. The Düsseldorf international airport (DUS) is also convenient to Münster and offers connections from most European cities. Direct train connections from Airport Düsseldorf to Münster Central Station are provided every hour and last about 90 minutes. You can get to Münster’s central station by train from many German and European cities. Münster’s central station is located near the congress venue right in the city centre. Further information concerning railroad connections can be obtained from the website of the Deutsche Bahn. With the Deutsche Bahn, you can save money when attending your trade fair or congress! Take the train and profit from attractive prices and conditions. You can travel to Münster by car via the speedways “Autobahn A1” and “Autobahn A43”. If you are coming from the north of Münster, leave the Autobahn A1 at the exit “Münster-Nord” in direction Münster (Steinfurter Straße). Keep driving straight for about 5 kilometers until you can see the congress venue (the Münster Palace) on the right-hand side. If you are coming from the south of Münster, leave the Autobahn A1 or the Autobahn A43 at the exit “Münster-Süd” in direction Münster (Weseler Straße). Keep driving straight for about 5 kilometers until you can see the congress venue (the Münster Palace) on the left-hand side. There is a parking lot in front of the Münster Palace (Schlossplatz). 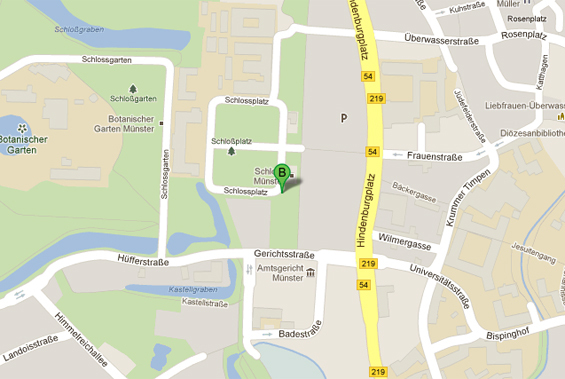 The exact address of the congress is Schlossplatz 2, 48149 Münster. From Münster’s central station, you can take the bus lines 11, 12, 13 and 22 to the congress venue. Get off the bus at the bus station “Landgericht”. You will find several taxis at the main entrance of Münster’s central station. Instruct the taxi driver to take you to “Schloss Münster” or to “Schlossplatz”.